■ Store in a cool, dark area in an open container or bag that allows air flow. Use within 2 weeks for best quality. Refrigeration of raw sweet potatoes can cause a hard center and an unpleasant taste. ■ Scrub under cool running water just before using. 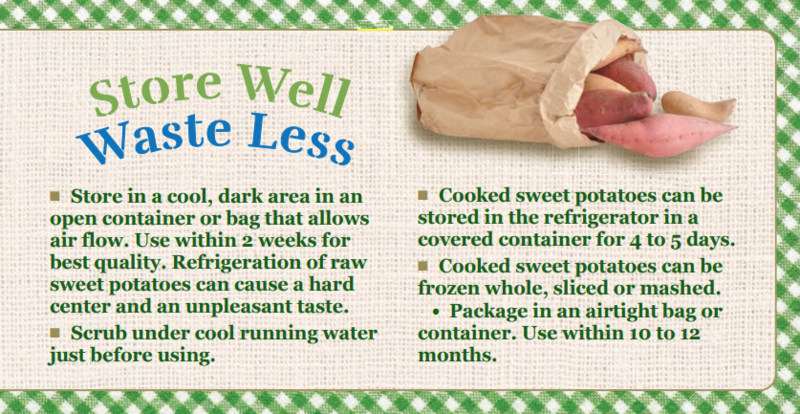 ■ Cooked sweet potatoes can be stored in the refrigerator in a covered container for 4 to 5 days. ■ Cooked sweet potatoes can be frozen whole, sliced or mashed. • Package in an airtight bag or container. Use within 10 to 12 months.